One of my favourite upcycled crafts has been transforming our old Ikea coffee table into a Lego Duplo table for the children. It’s probably the piece of furniture we’ve had the longest as I think we bought it 8 years ago when we first moved in together. It’s served us well. A couple of years ago it got its first transformation. It was given a coat or two of blackboard paint so the toddler could do his mark making on it. He quickly got bored of that idea (walls were much more appealing) so it was pretty un-used and even spent some time in the play house. The children have enjoyed playing with Lego Duplo ever since they could grasp a brick so we thought we’d turn it into a Lego Duplo table for them. It was the easiest upcycle ever. We hopped on the tube to Ikea and picked up two BYGEL rails from their Kitchen accessories and 6 colourful BYGEL containers to hang on them. The rails were £2 each and the containers only 60p each – our cheapest Ikea trip ever. One evening we lightly sanded the top of the table before glueing a spare Lego Duplo base board in the centre of the table with Evostik contact adhesive, we weighted it down with some heavy books and left it to dry overnight. The next day we added the two rails to the legs of the table, one on each side, and hung the cups from them to use as Lego storage. As a final touch we painted lines around the base board to look like a road. 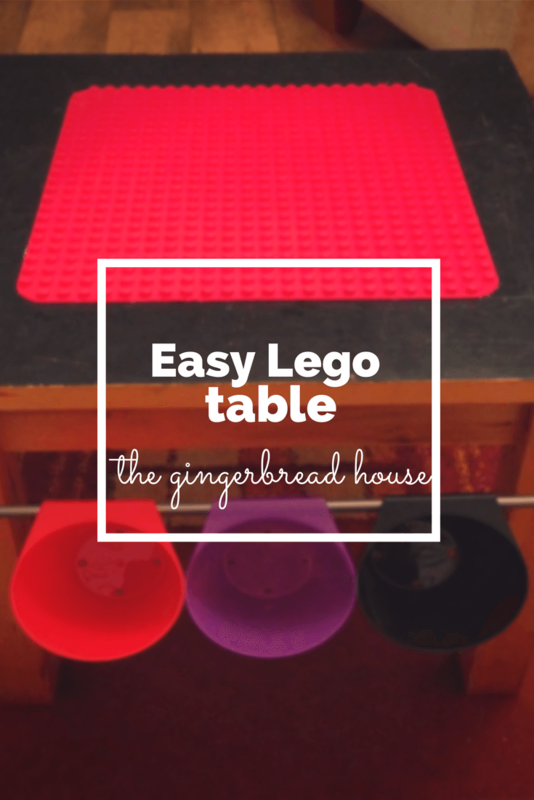 The children love their Lego Duplo table and it’s been a big hit with them. We already had two Ikea Sundvik chairs so they are quite happy to sit at their table and play. They’ve built Lego houses, schools, air craft hangers and petrol stations and had races around the road too. Not a bad return for a couple of pounds spent in Ikea! aaah we did that last year for H’s fourth birthday, but as a Lego table – it’s brilliant too, all the expensive tables are too small for her now, but her table lives on! Ikea do some nice small chairs to go with it too! The 4 year old is just starting to like proper Lego so I’m hoping I can remove the base board at some point and swap it with a Lego base board! This is a brilliant idea, how very clever of you! I would never have thought of that – it looks fab! What a fantastic idea – you are so talented. What a great idea, I love this! Definitely one to try and do myself, thank you! I think that this is a very clever and innovative idea! My daughter would love one of these! Fabulous idea! Keep all that evil lego in one place 🙂 And make it as easy as possible to clean up! Its a great way to get the kids outside in the summer too, just pick the table up and go!